The Ashland girls’ basketball team had gone nine years between tournament appearances before qualifying the past two seasons. The Hornets now are making their third consecutive trip to Bangor’s Cross Insurance Center next week, and can thank brilliant foul shooting and an improbable late-game comeback for getting them there. The Ashland girls’ basketball team had gone nine years between tournament appearances before qualifying the past two seasons. The Hornets now are making their third consecutive trip to Bangor’s Cross Insurance Center next week, and can thank brilliant foul shooting and an improbable late-game comeback for getting them there. Ashland connected on 17 of 20 free throws in the game, hitting six in a row during the team’s 17-2 run to close the game, in Monday’s 54-47 win over Jonesport-Beals in a Class D North preliminary playoff game at Ashland District School. The team’s point total was the largest of the season and the accurate foul shooting played a huge role. The seventh-ranked Hornets improved to 8-11 and will face No. 2 and undefeated Deer Isle-Stonington in the Feb. 18 quarterfinal, set for 11:05 a.m. The teams also matched up in last year’s quarters, with the Mariners coming away with a 33-20 victory. No. 10 Jonesport-Beals, which prevailed at Washburn in a prelim last season, finished with a 7-11 record. Momentum switched on several occasions in the contest. 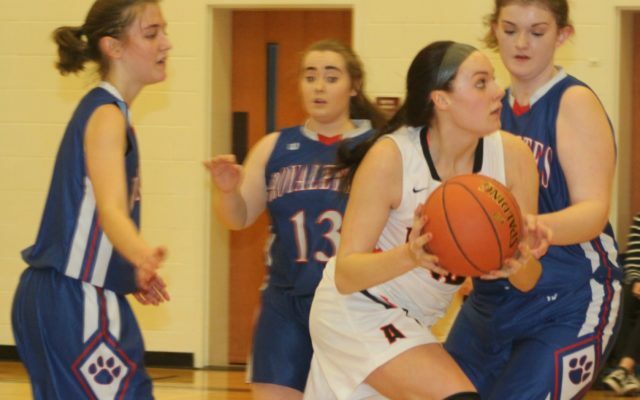 Ashland took a 7-2 lead in the first three minutes, then the Royalettes scored 23 of the game’s next 30 points to grab their largest advantage of 25-12 with five minutes left in the first half. The Hornets then scored 14 consecutive points right before intermission and went into halftime down by only one (27-26). The seesaw game continued in the second half. Ashland tallied the first seven points and a few minutes later Jonesport-Beals went on a 12-0 spurt to regain control with a 45-37 edge with less than six minutes remaining in the game. Ashland went on the final big run, outscoring Jonesport-Beals 17-2 the rest of the way to prevail. Foul shooting was consistent on both sides, as the Royalettes went 7 of 10 during a stretch in the second half and finished a respectable 13 for 21. But Ashland used its relentless defensive pressure to force 12 turnovers over the final five minutes and took advantage as sophomore Jamie Poulin tallied eight points during the flurry, including the go-ahead basket with 1:05 to play. The Hornets’ lone senior, Olivia Tardie, then contributed a conventional 3-point play 26 seconds later before Poulin hit two free throws with 22 seconds left to secure the victory. “We knew what we had to do to finish the game and that was to pound it in and drive to the basket, and that’s what we did,” Poulin said. Junior Shelby Stolze, who staked Ashland to the early lead with seven quick points, paced the offense with 16 points. Tardie totalled 15 points, while Poulin added 14. Junior guard Kaylee Ireland netted 24 points, including four 3-pointers, to lead Jonesport-Beals. Alexsis Sprowl, the Royalettes’ lone senior, finished her career with a 14-point performance.